How often do you read a review of a show and are sceptical about it? Could it really be that good? The only way to judge is to see it and decide for oneself. Having heard about it in Seoul over the last few years I was intrigued and was determined not to miss the opportunity. So I duly went to the ROSE THEATRE in Kingston on the 16th of June. The storyline and instructions to the audience, in Korean and English, were projected onto a screen on the stage. Immediately the laughter began and continued right to the end of the show. The story unfolds as three unprepared cooks are informed that they have to prepare a wedding meal by six o’clock. To make matters worse the manager’s nephew is foisted on them with the instruction to teach him to cook. Thus, the mayhem starts and continues throughout the show. All the props used are kitchen utensils and equipment-very sharp knives, pots, pans, brooms etc. The accompanying rhythms add to the atmosphere. A simple concept wonderfully developed into a stage show. The skill of these athletic performers-as four cooks and the manager-is something to see. There is drumming, singing, juggling, magic, mime, martial art moves, the handling of very sharp knives and not to mention continuous humour-all this at breathtaking pace. Normally a few well chosen words adequately describe a production but on this occasion this will not suffice. 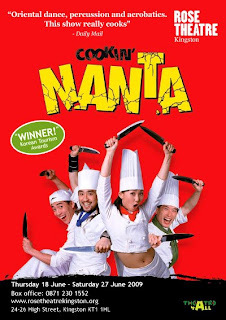 NANTA cookin’ is vibrant, artistic, energetic, pulsating, entertaining, exciting, unforgettable, very funny and downright sensational. NANTA in Korean means “to strike relentlessly” and is an extremely apt title for the show. What memories will I take away? The nonstop laughter of the audience, the clever use of kitchen utensils (albeit not in the usual way) and the most entertaining and dynamic performance I’ve seen for many a year.